Zimbabwe's President Robert Mugabe is ready to contest a second round of the presidential election, a spokesman for his ruling Zanu-PF party says. Deputy Information Minister Bright Matonga said if results from Saturday's election showed a second round was necessary, Mr Mugabe would stand. Official results from the presidential poll have yet to be issued, but the opposition says it won the vote. Mr Mugabe has been seen in his first TV appearance since the poll. State TV carried footage of him meeting former Sierra Leone President Ahmed Tejan Kabbah. Mr Tejan Kabbah also had talks with opposition Movement for Democratic Change (MDC) leader, Morgan Tsvangirai, AFP reports, prompting further speculation that some form of African mediation effort is under way. There are reports that senior members of the MDC leadership in Zimbabwe have gone into hiding after their offices in a Harare hotel were ransacked, BBC sources say. A nearby lodge housing foreign journalists has also been raided by paramilitary police, a journalist who fled the hotel told the BBC by telephone. On the issue of a run-off, Zanu-PF's Mr Matonga told the BBC: "If there is no clear winner, the laws stress that you have to go for a run-off." Under election rules, a candidate needs to win at least 50% of the vote to avoid a second round. "President Mugabe is going to fight to the last, and he's not giving up, he's not going anywhere, he hasn't lost the election," said Mr Matonga. Zanu-PF was leading in the popular vote and if translated into a presidential vote, that would mean victory for Mr Mugabe, he said. Zanu-PF's leadership is holding a meeting on Friday to discuss strategy. 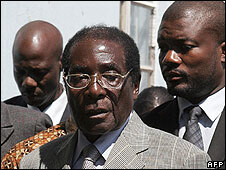 Local reporters say the party is split on whether Mr Mugabe should fight on. Party sources are reported as saying the meeting will be chaired by Mr Mugabe and the election will be at the centre of discussions. A BBC correspondent in Zimbabwe said there was a general sense of the nation being in limbo. Fewer riot police are on the streets than on Wednesday, our correspondent says, but although some people have held parties this week to celebrate what they see as a likely MDC win, no-one was feeling quite so confident on Thursday. A leading Zanu-PF figure told our correspondent that members of the party's top decision-making body, the politburo, were getting distinctly nervous: "If you were them, you wouldn't want to put all your eggs in one basket," our correspondent was told. The opposition received a boost from the publication of official results from the parliamentary election on Wednesday. 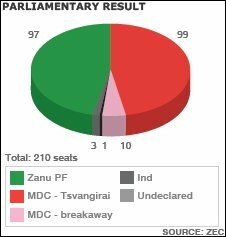 Figures from the Zimbabwe Election Commission gave the MDC a majority of seats, displacing Zanu-PF. 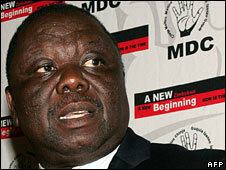 Morgan Tsvangirai's MDC took 99 seats, while Mr Mugabe's party polled 97. A smaller MDC faction which backed former Zanu-PF minister Simba Makoni in the presidential polls won 10 seats leaving them with a potentially influential future role. Is Mugabe losing his grip? Party ready to abandon Mugabe? But in terms of the popular vote, the figures gave Mr Mugabe's party the lead - 45.9% to 42.8% for the MDC. With presidential election results still awaited, the MDC said on Wednesday that its leader had won, though Zanu-PF denied this. The MDC released its own results to back up its claim, saying Mr Tsvangirai had won 50.3% of the vote to Mr Mugabe's 43.8%, so avoiding a second round of voting. But those figures differ slightly with the Zimbabwe Election Support Network, a coalition of civil society organisations, who said Mr Tsvangirai had won 49% to Mr Mugabe's 42% - which if true would necessitate a run-off. The electoral commission said on Thursday that official results for the 60-seat upper house, the Senate, had been delayed because of "logistical problems". Mr Mugabe, 84, came to power 28 years ago at independence on a wave of optimism. But in recent years Zimbabwe has been plagued by the world's highest inflation, as well as acute food and fuel shortages.